To be considered in Fortune magazine’s top 50 business persons of the year is a huge honour considering the weight of the other names like Mark Zuckerberg of Face Book, Jeff Bezon of Amazon, Larry Page of Google, Tim Cook of Apple and so on. Featured in this year’s list at position 34 is a Sri Lankan — Ajita Rajendra. 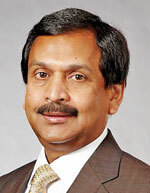 Fortune states “In his four years as CEO of this Milwaukee-based maker of water heaters (A. O. Smith & CO) , Rajendra has kept the company boiling hot, doubling profits and nearly tripling the company’s stock price with strong growth in North America and China”. Sri Lanka in the sixties. He is the nephew of former Minister M. Thiruchelvam. In contrast to today’s world of bond scams, M. Rajendra was a public servant of the old school reputed for his integrity and honesty to the extent that he reportedly refused to remit his sons full school fees to India because it would exceed the amount permitted by the prevailing laws of the day! Rajendra had his schooling at St Thomas’ Mt. Lavinia and a Bachelor’s degree in chemical engineering from the Indian Institute of Technology and an MBA from Carnegie-Mellon University, Pittsburgh, Pa. His distinguished career in St Thomas’ included a place in the schools Rugby team and Athletics team. Ajita Rajendra joined A. O. Smith in January 2005. He was named as its Chairman and Chief Executive Officer on April 7, 2014, the ninth CEO in the company’s history. His primary responsibilities include strategy development and implementation, profitability, and shareholder returns. He previously held the positions of President and Chief Executive Officer and President and Chief Operating Officer, responsible for A. O. Smith’s water heater operations in North America, China, Europe, and India, as well as the company’s water purification business in China and the Lochinvar global boiler business. He also serves on the board of other listed companies in the US. A. O. Smith Corporation, with headquarters in Milwaukee, Wis., is a global leader applying innovative technology and energy-efficient solutions to products marketed worldwide. The company is one of the world’s leading manufacturers of residential and commercial water heating equipment, offering a comprehensive product line featuring the best-known brands in North America and China.